Today is one of those days.. it seems like every day is one of those days! There I was, working on a translation and I looked at the clock.."oh my, it's 12.45! My husband will be home in 10 minutes and I haven't even started thinking about lunch!" My fridge is also quite bare because I haven't had a chance to go shopping so my possibilities were quite limited! I had the half a bottle of tomato sauce left over from the other day, some pitted black olives left over from last night's dinner... parsely, garlic, olive oil which are never out of stock in my kitchen! parmesan cheese..
when the garlic starts to sizzle lower heat to medium and throw in a few handfuls of pitted black olives. Green olives and even those green olives stuffed with red pepper would also be delish, I am sure!. Before you throw in the olives, squeeze each handful to kind of crush them so they release their flavour better. 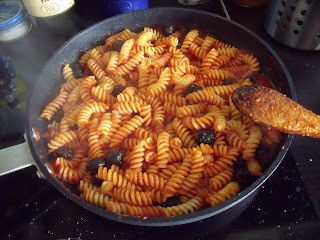 add a nice handful of italian parsely (not the curly kind. I don't chop it, I just remove the stems, that way picky eaters can pick out the leaves if they so desire!). By now the water is boiling, so salt it and throw the rotini in to boil (I used rotini because that's what I had in my pasta drawer, but penne or any other short pasta will do fine). 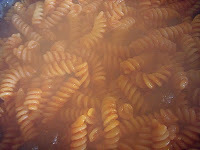 When the sauce comes to a boil, lower it and let it simmer until the pasta is cooked. 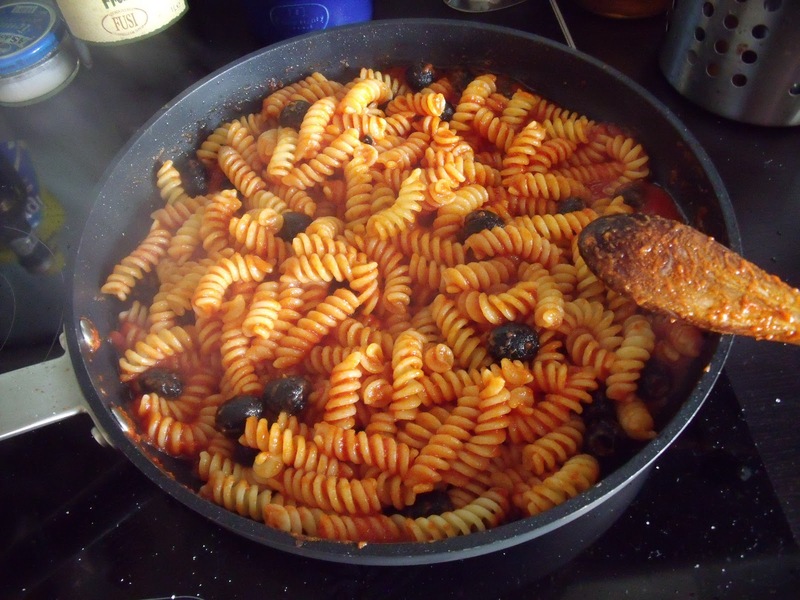 When the pasta is cooked to your liking, drain it in a colander and add it to the sauce. Raise the heat and toss the pasta with a wooden spoon to coat each piece of pasta with the sauce. That's it. You're done! Serve with grated parmesan or (Italian friends don't be shocked) I think this would be great with coarsely grated white longhorn colby, altho I can't try it because I can't buy longhorn colby here!